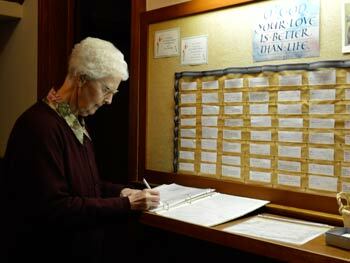 Sister Norma Schlick and others spend part of each day ensuring the prayer board at the Motherhouse is up to date. It doesn’t matter what time of day it is. You can find Sisters of St. Joseph in the Sacred Heart Chapel or in the small chapel on second floor. They are the Sisters retired from active ministry who now live at the Nazareth Motherhouse in Concordia, and their ministry now is prayer. The community initiated a prayer apostolate in 1977. We extend an invitation to all those needing prayer to send your request to us for remembrance in prayer. The prayer board is set up not far from the main chapel, and Sisters regularly check intentions posted there.